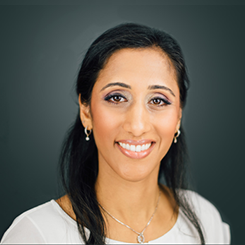 Dr. Monica Vaghela has had a passion for natural healing for as long as she can remember, and was raised using natural remedies. During her medical studies, she learned that many synthetic drugs have a similar chemical makeup of plants naturally occurring in our environment. This sparked her interest in natural medicine and led her to discover her career in natural medicine. Dr. Vaghela approaches patient care by looking at the whole person and finding the root cause, using an integrative approach. She takes the time to listen to her patients to provide the best possible care using various modalities, such as: acupuncture, homeopathy, IV nutrient therapies, ozone therapy, nutritional therapies, botanical medicine and bio-identical hormone therapies. Patient education is very important to Dr. Vaghela, and she spends a great deal of time ensuring that the patient understands the reasoning behind the illness and provides the tools for the body’s innate healing ability. She also volunteers her time to educate children about natural health and is recognized as a leader in community outreach.